Hobbies: Sewing, quilting, and collecting vintage sewing ephemera. Favorite Type of Sewing: I sew it all! Erika is a textile artist and color theory enthusiast who inherited her love of sewing and art from her mother at an early age. From her first sewing projects of doll clothes and stuffed animals, Erika has learned many sewing techniques and styles, from garment and corset construction to fabric dyeing and quilting. Merging her love of both sewing and art, she has earned a Bachelor's Degree in both Fine Arts and Fiber Arts. 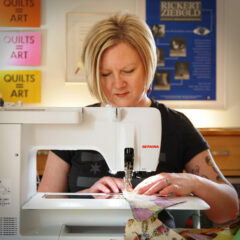 Erika currently resides in Chicago, Illinois where she continues to create and share her love of sewing and art. Diary in Stitches Blog Tour + Giveaway! My Quilt is on QUILTY! Sunrise Baby Quilt: Bind It! Sunrise Baby Quilt: Ready, Set, Go Get Your Fabric! What To Pack for a Quilt Retreat? Baby Blanket Gift: Easy as 1-2-3! T-Shirt Makeover – Maternity Style!